Honey-Can-Do CRT-02214 10 drawer rolling storage cart, multicolored. 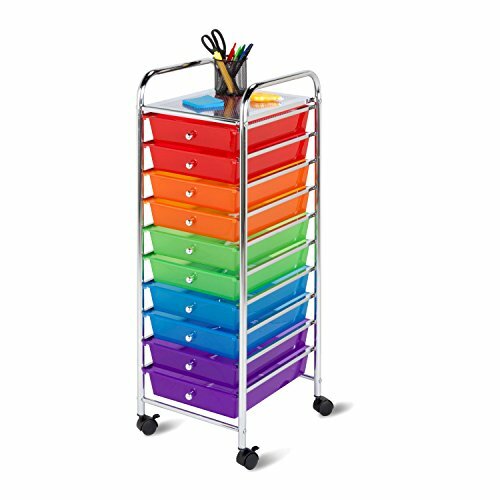 Perfect for the home, classroom, or art studio, this 10-drawer organizer features brightly colored, easy-access drawers. Great for paper, tools, accessories, crafting, scrap booking, or your home office. Great for color coded organizing, this cart features 11 inch W x 15 inch L x 2.5 inch d drawers in red, orange, green, blue, and purple. Smooth glide Casters make this cart easy to maneuver and Lock in place. The chrome, perforated top surface measures 11 inch W x 15 inch L and is a comfortable 34.5 inch off of the ground. The sturdy chrome frame is both attractive and functional. Assembly tools and instructions are included.